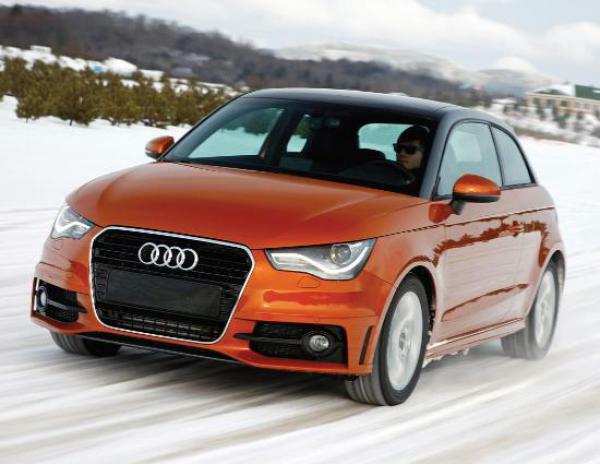 An Audi A1 quattro prototype that brings all-wheel-drive to the premium subcompact hatchback segment for the first time is currently undergoing a baptism of fire grappling with freezing conditions on Canada’s densely snow-packed roads. The one-off development car was one of the stars of the ‘Fascination of quattro’ event which took place in Montreal to celebrate the past, present and future of the legendary four-wheel-drive system, which reached its 30th anniversary in 2010. It reaffirms the Vorsprung durch Technik brand’s commitment, made at the 2010 Paris Motor Show, to underpin future high performance variants of the A1 with this proven driver aid. of the rear axle for an optimized distribution of weight. Inside is a package of plates that rotate in an oil bath. During normal driving, the clutch sends most of the engine’s power to the front wheels. If the front axle loses grip, the clutch can instantly transfer torque to the rear axle by forcing the plate packages together. A pressure reservoir helps the electric pump to develop the necessary oil pressure. The UK A1 range currently offers a choice of ten frontwheel-driven models powered by 1.2-litre TFSI (86PS) and 1.4-litre TFSI (122PS) petrol engines and a 1.6-litre TDI (105PS) diesel, and is priced from £13,420 OTR to £18,665 OTR. Even before it filters into the most diminutive of Audi models, the quattro system is already a feature of over 120 variants in the Audi line-up, from the A3 hatchback through to the R8 super car.